South Korean Unification Minister Cho Myoung-gyon shakes hands with his North Korean counterpart Ri Son Gwon after their meeting at the truce village of Panmunjom inside the demilitarized zone, North Korea, Aug. 13, 2018. The United States said Wednesday the denuclearization of North Korea must follow the same speed as the advancement of inter-Korean relations, after Seoul announced the opening of a new liaison office. In Washington, a State Department official said the U.S. is aware of this development, urging Pyongyang to honor its commitment to finalizing the complete denuclearization of the Korean peninsula. “We reaffirmed the Panmunjom Declaration during the Singapore Summit and we did so because progress on inter-Korean relations must happen in lockstep with progress on denuclearization,” a spokesperson told VOA Wednesday. 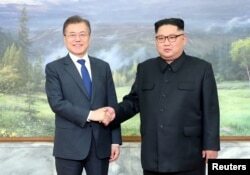 South Korea President Moon Jae-in has stated the improvement of relations between Pyongyang and Seoul cannot advance separately from resolving North Korea’s nuclear program, added the State Department official. The United States had considered opening a U.S. liaison office in Pyongyang in the 1990s, according to former State Department officials. The move at the time was part of diplomatic efforts to engage North Korea that grew out of the U.S. concerns Pyongyang was trying to attain the capacity to build nuclear weapons. A former U.S. official told VOA that Pyongyang backed off from the proposal in the end.